The Phillies had an off day today. 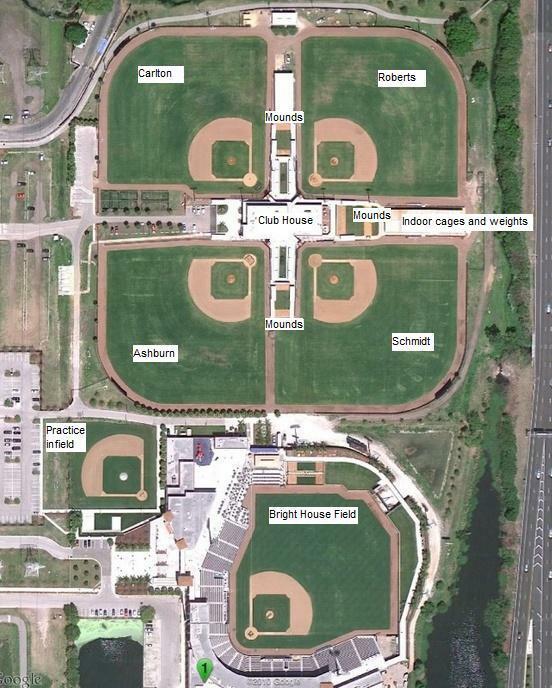 So, the minor leaguers were on all four fields at the Complex. That doesn’t mean that nobody went to DiMaggio Field. Group Four was split into two groups – the Williamsport staff remained behind on Schmidt Field, and the GCL staff hiked over to DiMaggio. Position players divided accordingly, all the group’s pitchers remained at the Complex. After stretching, the minor leaguers at the Complex threw for about ten minutes to warm up their arms. Pitchers scheduled to throw from a mound went to the Seven Mounds. (Again, there was yellow string stretched across the top and bottom of the strike zone. And, a third string was lower, about ankle high.) The remaining pitchers waited to shag BP. And, during BP, ground balls were hit to the infielders. Once again, I was drawn to Coach Williams group. The opening group contains three catchers who appear to have good offensive skills. Colin Fitch and Henri Lartigue are college kids who have the best chance of sticking with this group. The second group contained Daniel Brito, Arquimedes Gamboa, and Darick Hall. Brito is still showing sneaky power belied by his lean physique. Gamboa looks like he is just a timing correction away from really driving the ball. And Hall is Hall. He punishes pitches and hit the only ball I saw clear the fence on this field. I drifted over to Ashburn Field where Jhailyn Ortiz was hitting. This powerful young man crushed a ball off the Spectrum Field sign behind the left field fence. This is an old stock photo. Picture a Spectrum Field sign where the Bright House Field sign. He actually stopped to watch it, something batters never do during BP. He sheepishly accepted the praise heaped on him by his team mates. At least, I think it was praise. Some of it was in Spanish. After the players returned from DiMaggio, they broke into their post-break groups. One more time, here’s the site map. The outdoor batting cages are at the head of the drive way leading to the club house, along the left field line on Carlton Field. Seven Mounds is the set of mounds between the clubhouse and the indoor cages and weight room. The practice field is the field I refer to as Bowa Field (when Jimmy retires, I’ll start calling it Rollins Field. And, of course, Bright House Field is now Spectrum Field. New twists to the drills are in bold text. The outdoor batting cages along the drive way – BP off a pitching machine. Ashburn – bunting off a pitching machine. Okay, today’s most interesting wrinkle was that the batter had to bunt 15 balls each turn. One, then two in quick succession, then three, then four, and finally five. If he misses one in a group he has to do that group again. A pop up equaled a miss. One kid, I think it was Jesus Henriquez, popped up the fifth ball in his five-ball set. He had to bunt another five cleanly to end his turn. As you might imagine, there is a lot of banter among the participants as the bunter struggles to concentrate. On the last round, batters try to bounce a bunt into one of two buckets coach sets up about 15 feet from the plate. Jonathan Guzman showed some amazing bunting skills. The right-handed batter skillfully bunted his 15 balls then punctuated this achievement by bunting 5 more cleanly while holding the bat with just his right hand. Carlton – a.) flyballs off a pop up machine for outfielders aimed at the right field fence. Players had to judge their retreat to the fence. Keudy Bocio reached over the fence to bring two balls back. The 6’8 Carlos De La Cruz caught two similar balls without leaving his feet. b.) PFPs for pitchers and infielders. Fielding bunts in several situations with throws to the base dictated by the situation and the call of the catcher. Roberts – a.) pickoff moves, no base runners. A pitcher served as a catcher to give the pitcher a target. Not a good idea. Shane Watson took a ball off his shin and was in some pain as he danced around shaking it off. He ended up by us and I told him to make sure that when that pitcher was behind the plate he made sure he was pitching. Haha b.) position players were given instruction at each base. The talks at each base ran long. No action, though, just lecture. c.) out in deep center field, a pitcher would simulate a pitch to a catcher. The coach would designate left or right, and the catcher would have to retrieve a ball on that side and throw to the pitcher covering the plate. Schmidt – Infielders were drilled on double plays. Three coaches kept balls in play in this “modified fire drill”. Pitchers stretched using elastic bands attached to a fence in left field. This exercise made me nervous as I recalled Matt Imhof. Interesting observation – the grounds crew “sweeps” the field between groups. Seven Mounds – pitchers soft-tossing to each other. The mound between Schmidt and Ashburn – a couple of pitchers not known to be on rehab assignment, threw under the watchful eyes of Ray Burris, the organization’s Rehab Pitch Coach. They wore nameless red shirts and were Jacob Waguespack and Nick Fanti. Some players peeled off to eat lunch. Others went to the indoor cages. 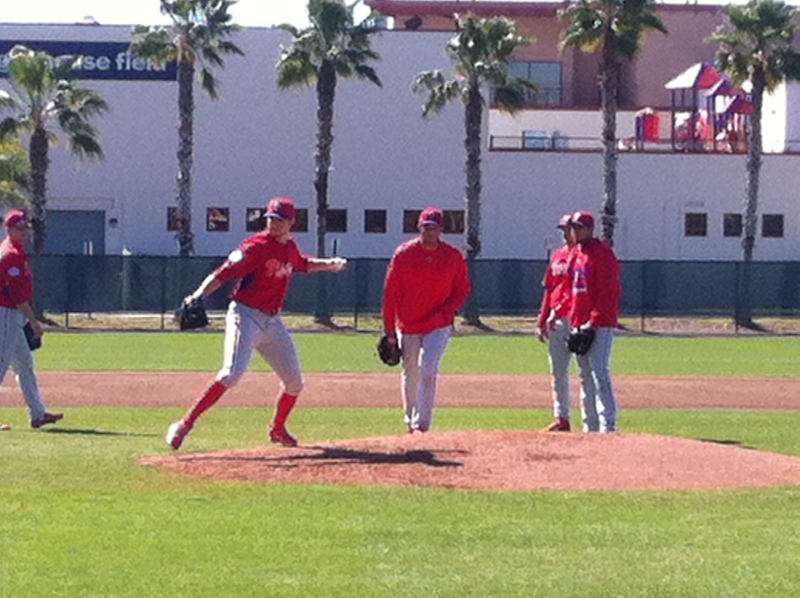 And pitchers who completed their work began doing their running. When the position players finally broke for lunch, so did we. Once again, no group assignments available. So, this is what we have to go by. I did NOT see Anderson, Hammer, or Cabral at the Complex. I think I saw Mark Laird, but I can’t be sure. I didn’t see Anderson, Hammer, and Cabral practice today. These four guys are on rehab – Mario Sanchez, Grant Dyer, Sutter McLoughlin, and Kevin Gowdy. And, I haven’t spotted these guys yet – Gabriel Lino, Mark Laird, Josh Tols, and Adron Chambers. Well done Jim as always. Nice meeting and chatting with you at the complex yesterday. Keep up the good work.